Below you can view all the homes for sale in the Fountain Crest subdivision located in Conyers Georgia. 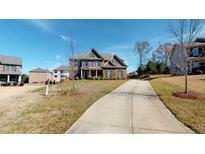 Listings in Fountain Crest are updated daily from data we receive from the Atlanta multiple listing service. To learn more about any of these homes or to receive custom notifications when a new property is listed for sale in Fountain Crest, give us a call at 404-998-4166. All W/ A Full Daylight Basement Ready To Be Finished. MLS#6529543. Fathom Realty Ga, Llc.. The Yard Is Perfect For Pets. MLS#6529683. Jar House Llc. Home Size Is Larger Than Indicated In Tax Records. MLS#6524949. Homeland Realty Group, Llc..
Side Entry Garage. New Roof 2018. Welcome Home! MLS#6516257. Coldwell Banker Residential Brokerage. Bed rooms Up W Big Closet, 1 Is Master Size. MLS#6515108. Atlanta Communities. Master Bedroom On Second Floor Has Sitting Room Area And Master Bath Has Double Vanities, Jetted Tub, Separate Shower, His And Her Closets. Located In A Swim/Tennis Community. MLS#6509385. Virtual Properties Realty.Net, Llc..
Plus A Few Finished Rooms In The Basement Which Includes Another Bedroom, Full Bath And A Family Room For Everyone. Schedule A Tour Today... MLS#6505927. Norman & Norman Realtors. Crown Molding Throughout And Custom Keystone Arches On The Main Level. MLS#6502530. Mark Spain Real Estate. The Over-Sized Loft With Media Room Potential Is An After-Hours Paradise That Connects All Bedrooms! MLS#6120362. Myers Team Realty. Bring Your Buyer To See The Awesome Home. MLS#6102502. Eastside Realty Group, Llc. This Stunning Home Located In The Beautiful Fountain Crest Community Offers 1-Sided Brick Front With A Grand 2-Story Foyer, Separate Living, Dining, And Family Rooms With An In-Law Suite Or Office On The Main Level, The Gourmet Kitchen Includes An Oversized Island With A Built In Desk And Lots Of Cabinet Space, The Master Suite Offers A Sitting Area With A Dual Vanity Ensuite, Full Unfinished Basement, Home Never Lived In, Swim/Tennis Community, Convenient To Local Shopping And Highways. MLS#6078758. Virtual Properties Realty.Net, Llc..